Station 8 of Royal Canadian Marine Search and Rescue (RCM-SAR) is an all-volunteer group dedicated to providing Search and Rescue to the waters around Delta, British Columbia. Trained crews stand ready to respond within minutes of being paged, 24 hours a day, 365 days a year. The unit has the unique distinction of being the only RCM-SAR station to operate out of a U.S. location, but the Point Roberts Marina has proven to be an excellent location for visibility and access to the large and often weather-beaten Straight of Georgia. 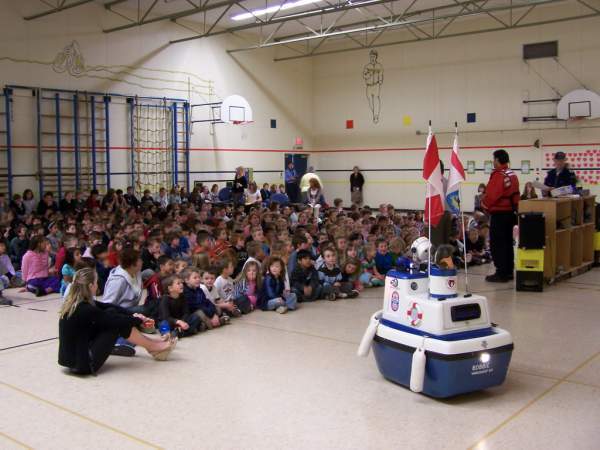 The unit also delivers Boating Safety programs to the community, providing Pleasure Craft Courtesy Checks and lectures on boating safety to local groups and yacht clubs in the Delta and Point Roberts area. 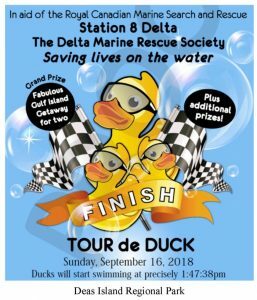 The Delta Marine Rescue Society (DMRS) is the non-profit society which supports Unit 8. Except for partial reimbursement of fuel for training and emergency calls,RCM-SAR stations do not receive government funding. All funds used in the operation and equipping of the rescue boat are raised by the DMRS in the community of Delta. Your support and contributions are critical. The time commitment for non-SAR volunteers is minimal, but the rewards are great, and you help provide a valuable community service. What a day it was! Tour de Duck 2018 may be in the history books, but it was a memorable day! Heavy showers in the morning had us a bit worried, but the sky brightened up and the sun even poked through from time to time. At the appointed time our “test duck” was launched, but the tide and current weren’t quite on board yet, so the start was delayed. Our terrific MC Ian Paton (our Provincial MLA) kept the crowd entertained and folks enjoyed the sunny breaks along the beautiful riverside Deas Island Park. Tasty hot dogs on the bbq kept the hunger pangs at bay & great music kept the crowd dancing. In due time, the tide and current and weather and stars were all in alignment. Jamie the polar bear from the Delta Police Pipeband ushered in the start of the racing and the crowd began the count down. The beautifully decorated corporate ducks were already in the starting gate and the racing was on. It was a tight race, but the sponsor duck from West Coast Seeds won the corporate race. Congratulations! Next it was time for the main event. There was a ticket holder for every one of the 4,500 rubber ducks. They were placed in the starting gate and the race was on. The top 20 winning ducks are listed in a photo attached. Congratulations and we will be contacting the winners to connect you with your prize! 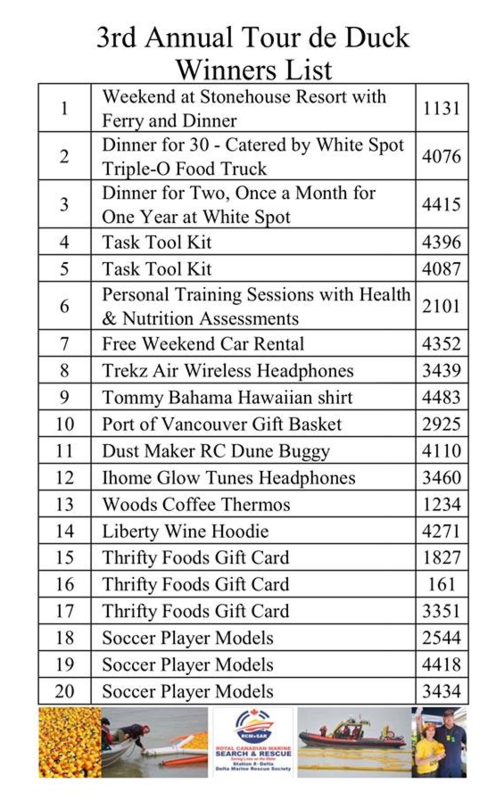 Congratulations all and a huge THANK YOU for your support of RCMSAR Station-8 Delta. Your support helps us in our mission of Saving Lives on the Water! Hypothermia Basics from RCMSAR 08 on Vimeo.